Nothing more, nothing less – yet more than it seems. Walking is as close to doing nothing as you can get – yet it is something more. It is many things actually: a way to escape, to think about something or to think of nothing, a means to meander, a way to be. My son Gabe is a “thru-hiker,” that is, he has walked the entire 2,190 mile Appalachian Trail, stretching from Springer Mountain, Georgia, to Mount Katahdin in Maine. He walked through 14 states, 8 national forests, and 6 national parks, tackling the toughest trail’s end through the dense forests of Vermont’s Green Mountains, climbing the alpine peaks of the Whites, culminating in the 100-mile wilderness of Maine. On occasion, we would meet up as he came off the trail into a town. “It’s easy,” he would say. “Just one step at a time, putting one foot ahead of the other.” Yet at the same time, that act, as he found out, is profound, deep, simple and meaningful, because of all the things that happen along the way. It’s not just the strangers you meet but the thoughts you find, for on such a walk, you cannot escape yourself. One of the gifts of the trail is “Trail Magic,” that serendipitous meeting of strangers, who may greet you, offer a meal or a shower, even a campsite or a cabin for the night. 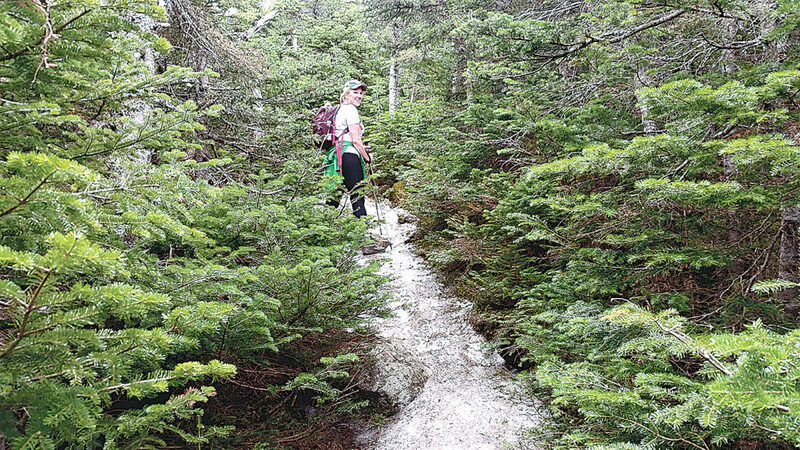 A week or so ago, I found myself thinking about walking while waiting for my husband Eli and Gabe to climb Owls Head, the last of 48 4,000-foot mountains in New Hampshire, a genuine milestone for Eli. As I walk with them in my mind, nurturing an injured muscle, I am cultivating patience. I do not take walking for granted. In fact, I think of it many times a day. Walking is not analytical, but improvisational. It is an unfolding of a path we “read” with our feet. Like a book, there is no way to predict what lies ahead. Each step turns a page, and so there is a built-in call for patience, forbearance, openness for what lies ahead. As we walk, we blur the line between feet and mind, moving from reality to imagination and back again. One month of walking influenced Robert Frost for the rest of his life. In 1912, virtually unknown and unpublished, Frost uprooted his family from the Derry farm, and moved to the Dymock region of England where, within months, his first book, and then his second, were soon published. In England, he met Ezra Pound, and a group of aspiring poets later referred to as the Dymock poets, among them celebrated biographer and literary critic Edward Thomas. In August 1914, Thomas and his family rented a cottage across from Frost. The two friends met each day to walk Dymock paths in all kinds of weather, walking their way to new thoughts about nature, poetry, prose and the spaces between. For them, familiar paths became new for neither could predict how paths of thought would unfold. Frost later called Thomas “brother.” When Thomas died in World War I, that month of walking became one of Frost’s most cherished memories. Not so for all of us. Throughout history, walking has defined public and private space – and the walking experience for men and women is worlds apart. Consider the public law about women in Middle Assyria from the 17th century to the 11th century B.C. Widows and wives were expected to wear veils, while prostitutes and slave girls were required not to wear veils, thus dividing women by two social castes. The implication was that women did not walk to see, but to be seen. A man’s sexuality remained private, yet a woman’s sexuality became public business. So walk if you can. If for some reason, you cannot walk, then walk in your mind. The zen part of walking is the most joyous – not knowing what you will discover along the way – in yourself, in your companions, in strangers, in Nature. I wish you “trail magic” along the way. Why walk? Solnit relates walking to the importance of musing. Quincy Whitney is a career journalist, biographer and poet – and she welcomes feedback. Contact her at: quincysquill@nashuatelegraph.com or quincy@quincywihtney.com.